There probably is no bird that is surrounded by as much myth and superstition as the Turkey Vulture. To many people a perched Turkey Vulture with its ruffled black feathers, stooped shoulders and bare neck and head represents the ultimate in physical reprehensibility. As disgusting as the bird may seem to some, it is (in my opinion) one of nature’s most beautiful designs. As everybody knows, all living things must die. It is basic to nature. In the world of animals, the two major causes of natural death are disease and starvation. Death by disease usually occurs in the heat of summer; death by starvation usually occurs in the winter. In nature, carcasses of both plants and animals are not wasted but utilized by other living organisms. Scavengers such as magpies, ravens and coyotes do their bit all year round. In the summer they are joined by insects and migrants. One of these migrants and summer residents is the Turkey Vulture. Along with the other scavengers it is designed to eat diseased and rotting meat without any ill effects whatsoever. As mentioned in Article No. 31 on the Western Gull, scavengers are nature’s garbage collectors and cleaning crews. 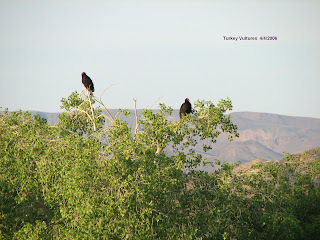 Unlike most scavengers, Turkey Vultures never kill their food. The Turkey Vulture is very well suited to do the work it does. Before any eating can take place, a food source must be found. By flying slowly and quite low to the ground, it thoroughly covers a good sized area in a short period of time. In the process, it expends a minimum of energy as it hardly flaps its wings but soars from place to place at a seemingly leisurely pace. With its extraordinary sense of smell it can literally “sniff” its prey out and can tell the difference between a dead and living animal. In this way a vulture can find a carcass even in the most heavily forested areas. Once the food is found the vulture then proceeds to eat. With its powerful bill it can tear the hide of a deer or elk with apparent ease. (To those who think they would like to hold a vulture beware its beak. It can lay on one mean bite). Then it proceeds to eat the internal organs leaving the rest of the meat for other scavengers. Ornithologists believe that the Turkey Vulture’s bare head and neck allow it to reach inside an animal’s body cavity without it getting its head and neck feathers soiled, if it had any. Why do people have such a low opinion of the Turkey Vulture? The reason is that it does many things that we, as human beings, find repulsive. First, it eats carrion. Second, it is a very unmannerly eater (sticking its head and neck into an animal’s body). Third, when frightened or cornered it projectile vomits a very foul smelling substance to repel its attackers. Fourth, on hot days it defecates (poops) on its legs in order to provide cooling. Fifth, it is large, black and scruffy looking. Sixth, when perched it simply looks ugly. None of the above six characteristics endear it to humans. Even a camera cannot improve its looks. Although not common overall, the Turkey Vulture is actually much more common around here than people realize. Why so? For one thing, it is almost always seen flying and most people simply think it to be a hawk. For another, it is a bird of forests, woods and cactus – places that make observation more difficult. However, livestock farmers do lose stock from time to time and usually haul out the carcass to some remote section of their farms, and it is here that one is most likely to find a vulture feeding. I have had several reports of rural people seeing them south of Wynyard. In Saskatchewan, the best place to see a vulture is in the Kamsack area near the Duck Mountains (where I saw my first one). Just last week, we saw several vultures drifting over the evergreen forests in the Pinawa area north of Winnipeg – an area that corresponds roughly to the Duck Mountains. Before Europeans came, vultures nested on the ground under deadfalls. One of their favourite nesting places at present is abandoned farmsteads and trapper’s cabins in forested areas. The Turkey Vulture is so named because it superficially resembles the familiar barnyard turkey. It is not related to turkeys nor, surprisingly, is it related to hawks or Old World vultures. Rather it is a relative of the stork. Its “cowboy” name of buzzard is a misnomer that actually applies to a group of hawks that includes the very familiar Red Tailed hawk. This week I have included two pictures that were taken in Big Bend National Park in Texas. We had just had lunch at a picnic site and were headed to our car when a Turkey Vulture walked out of the bush looking for some leftovers, and shortly after, it was joined by a pair of ravens. The other picture shows a pair of vultures (males and females the same) warming themselves to the sun early in the morning. As mentioned earlier, vultures are most often seen flying. Watch for a hawk sized large black bird that soars with its wings held in a V (dihedral). It soars in a rocking motion giving it the impression that it has had too much to drink and might be a bit tipsy. 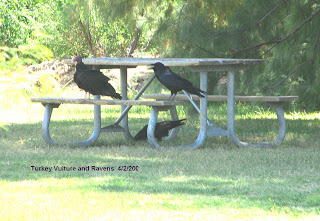 One also has to keep in mind that ravens are large black birds that soar also, but do so differently from the vulture. Once one knows what to look for, the vulture is unmistakable.